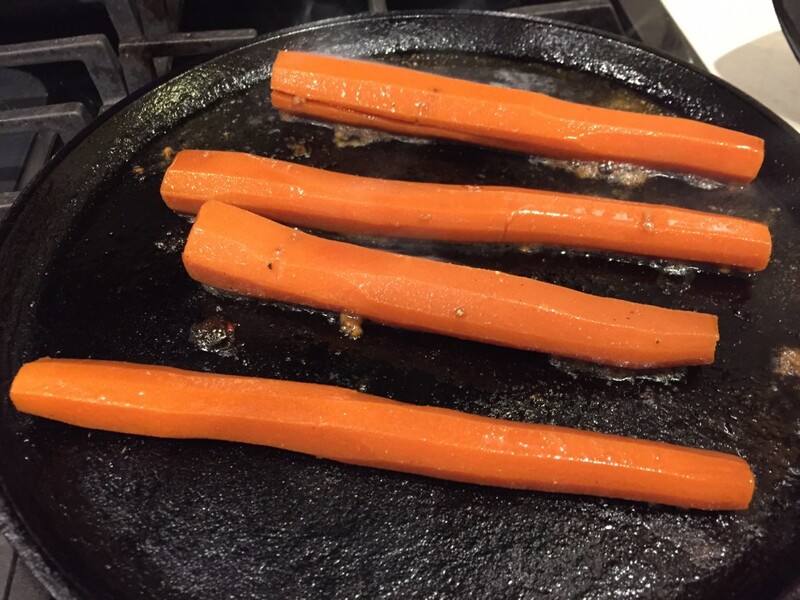 Carrot Dogs! Why haven’t I heard of this before? It is time for carrots to become a fast food treat, so move over tater tots. This seems so strange, but I am definitely bringing them to my next BBQ. 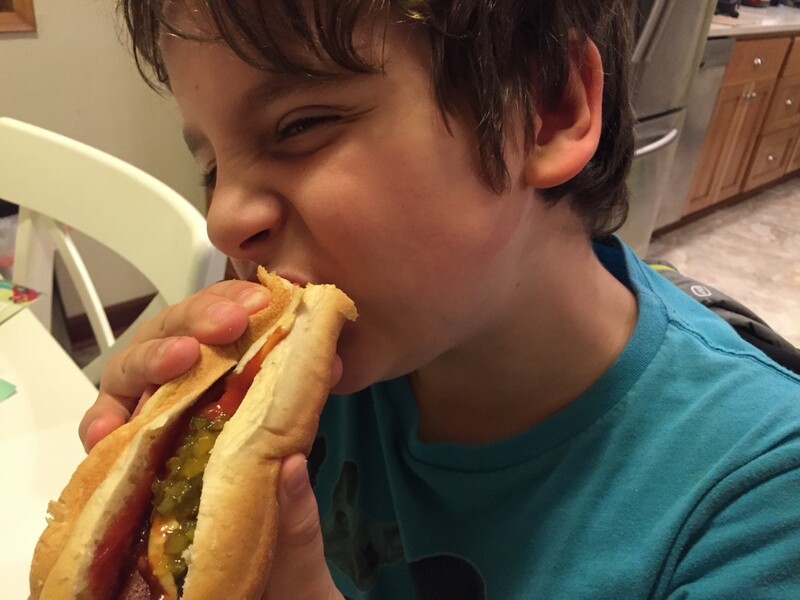 Basically, a steamed, marinated carrot replaces a hot dog. It tastes remarkably similar somehow, and you get to skip all the nitrates and unknown ground-up animal bits. 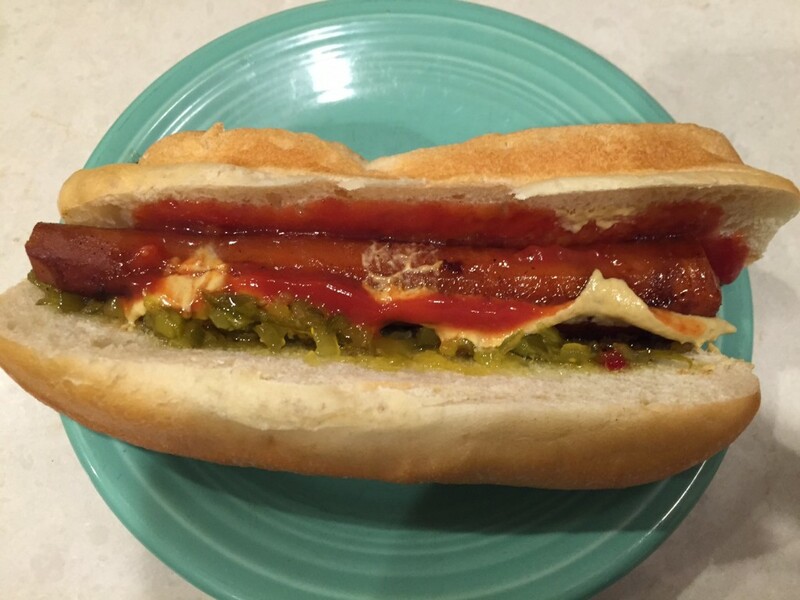 Found this Carrot Dog recipe on Clean Eating Veggie Girl. It was super easy, except you have to plan ahead since they marinate overnight. It was a big hit. Give it a try… the only thing I would do differently is use thicker carrots next time. It sounded like a great idea to try out a lot of vegan meats at the time. However, after eating the first one… I didn’t feel like eating a lot more. Not only was that one very good, but it completely filled whatever vegan meat roast desire I may have been wanting to satisfy. How many meat eaters really feel like eating a turkey every week? Anyway, if you are interested in different options: here is a list I found. It includes my choices, but with better photos. I have tried two from the list, and was planning to try the Field Roast version too. However, it costs $19.99 at Whole Foods- on sale. At this same store, they are selling young heritage turkeys for that same price. Making this animal’s life worth so little, and make the vegan option so expensive is just out of whack. I think this will change in the future as demand for veg options continues to rise. 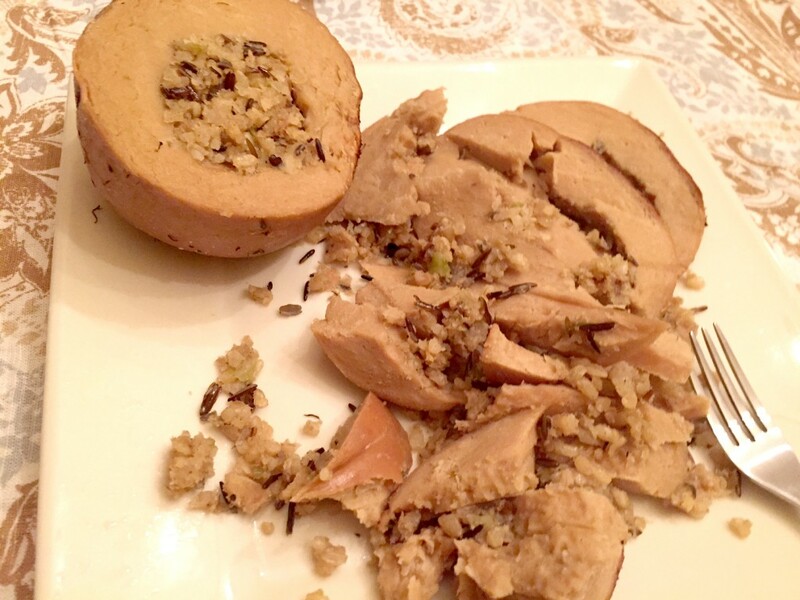 So, here is my review on Tofurky roast. Aesthetically, it was not as appealing looking at first, but I put it in my fancy roasting dish basted in olive oil and soy sauce and baked it for 1 hour, 20 minutes. It came out looking better with a few grill marks. It didn’t slice that well, but everyone said they liked it. Was it bad? No. I just preferred the Trader Joe’s version with the crust, with delicious gravy included. For our actual Thanksgiving, I might try making my own or will bring the TJ one. Will keep you posted. 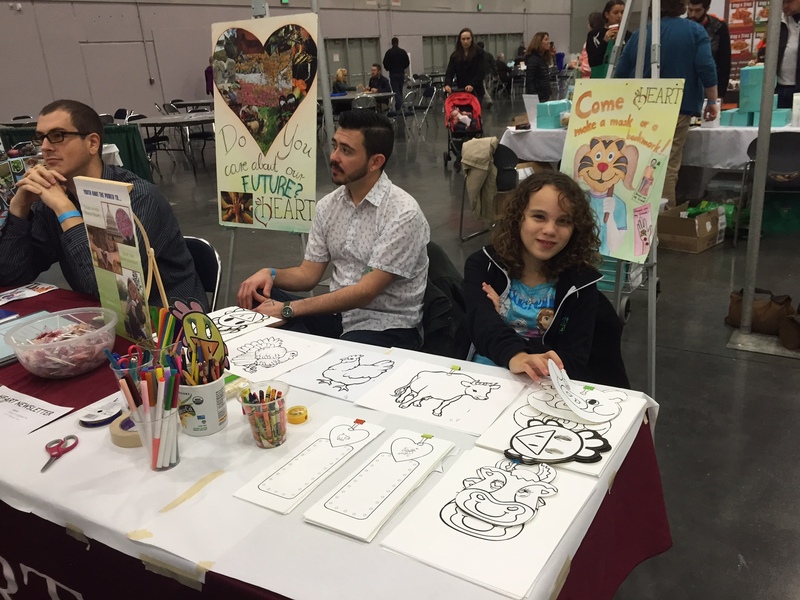 Last weekend I attended Portland VegFest for the 3rd time. This time, as an exhibitor. We were promoting our design business, as we would love to work with the types of businesses there. In fact, it turned out that we met a lot more people from the general public who were interested in talking to us. 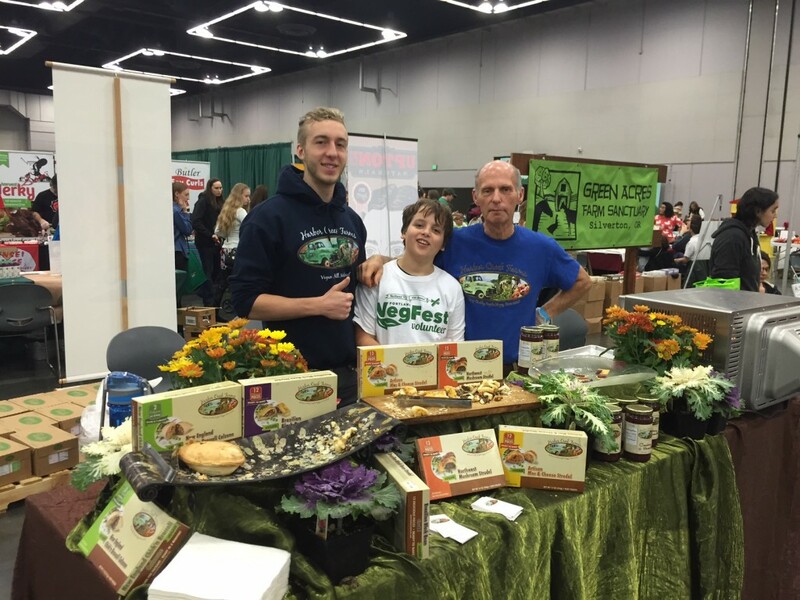 We’ve worked with NW Veg for years. Our design firm created their logo, ads, posters and different logos for their other events. I was so impressed once again with the quality of the speakers, and how organized they are. I popped out of our booth several times to try some samplings and there were a lot of new products, as well as some favorites from last year. So many people who attend aren’t vegan or vegetarian, and this event gives them the chance to see how delicious vegan food is, and feel confident buying it at stores. Since we were going to be there two days, we had the kids there for part of the days. I asked them to volunteer on Sunday, and they did really well! They do much better with helping when they are not with me. 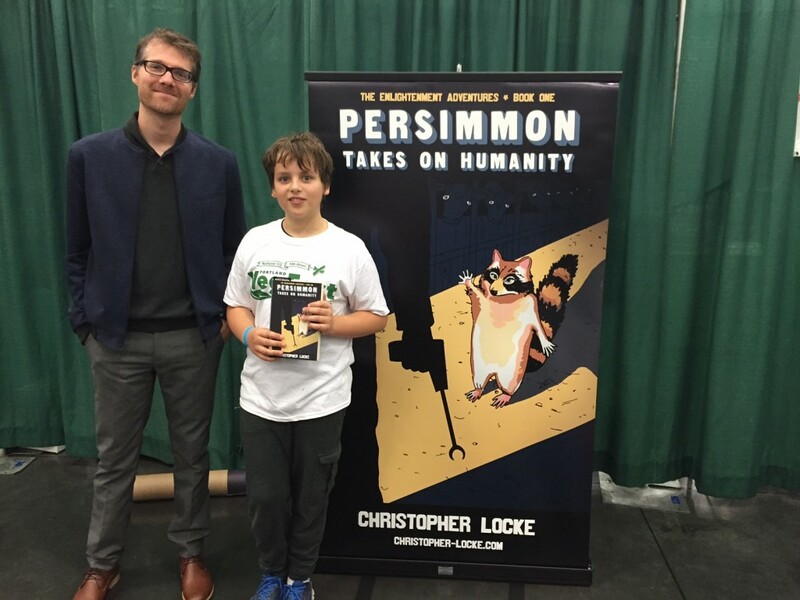 The rest of the time, they read “Persimmon takes on Humanity” the new young adult fiction book I bought there, and played on the phone, and ate samples. My highlights were meeting Colleen Patrick Goudreau and Sid Garza-Hillman. Sometimes you think you know quite a bit about a topic, but I learned a lot and had very interesting insights that will affect my activism and advocacy. Enjoyed Free from Harm’s Robert Grillo’s talk as well. It was gratifying to see how well the different vegan businesses were doing- Herbivore Clothing always had a crowd of people around them, Christoper Locke (the book author) sold out of his copies, and I saw a lot of people sporting the NW Veg membership bags as new members. I went back to Miyoko’s cheese table on Sunday afternoon and they had sold out completely. That made me both happy and sad. We bought a lot of food from the vendors, nut butter, renewed our membership and had a great time. I wish I had taken more photos! At the end of Sunday, I couldn’t resist popping up for a bit to see Dan Pirraro give his comedic talk “Food is Funny”. Then, ended up being late to return to our booth where my teenager was playing on my phone to discover the freight doors were open letting in cold air. Besides that moment of feeling like the worst parent ever, it was very good. 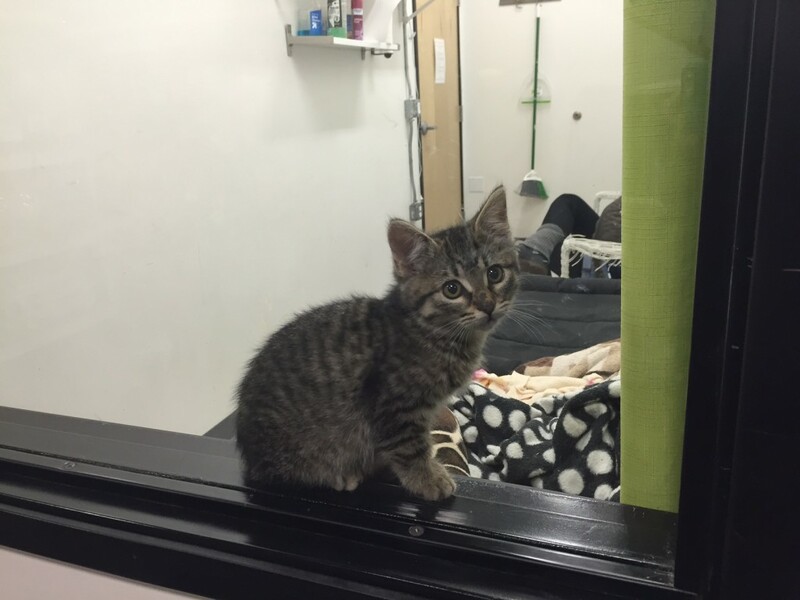 We ended the evening across the street at Pixie Project where we volunteer and gave love to the kittens there. Whether it brings in new business or not, it was well-worth it! Thank you NW Veg for creating this great event! We’ll be back next year. This year my parents surprised me with the news that there won’t be a turkey on the table this year. I’m thrilled that they decided this on their own. My mom told me she read the last blog post and agreed with it, but she had also been just going along with a turkey for years just as tradition. I think it was kind of a pain for her to deal with as well. She has an amazing repertoire of side dishes that I really can’t replicate (or don’t want to try), so I was thinking of making or bringing something to replace the turkey portion. I definitely don’t want to bring something that is not tasty, so we are doing some advance taste tests. Ideally, I would like to do the taste test with omnivores since I think our taste buds have changed from not eating meat for a few years. 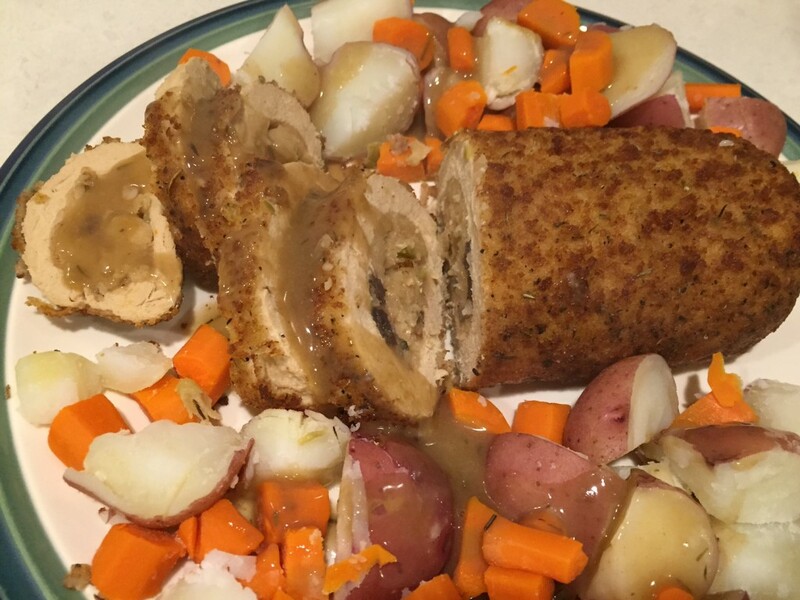 Tonight I made the Trader Joe’s Turkey-less roast which I picked up for $10. It includes gravy and has a nice breadcrumb coating with stuffing inside. On the photo, the turkey meat looks pretty realistic. First of all my son wouldn’t stop tasting the gravy it came with. It was very savory with herbs, quite good. I baked the roast covered for 25 minutes, then uncovered for 20 more minutes. It came out with crust nice and crispy and browned. I served it with some boiled potatoes and carrots. Now for the reviews: The kids freaked out! This might mean that we haven’t been making amazing dinners recently, but even the picky girl was crazy about it. It was supposed to serve 6, but there wasn’t a morsel left. The kids went over the top with their praise, “Tastes like angels made it!” “Mom, can we have this every night? Will you buy 1,000 of these”. 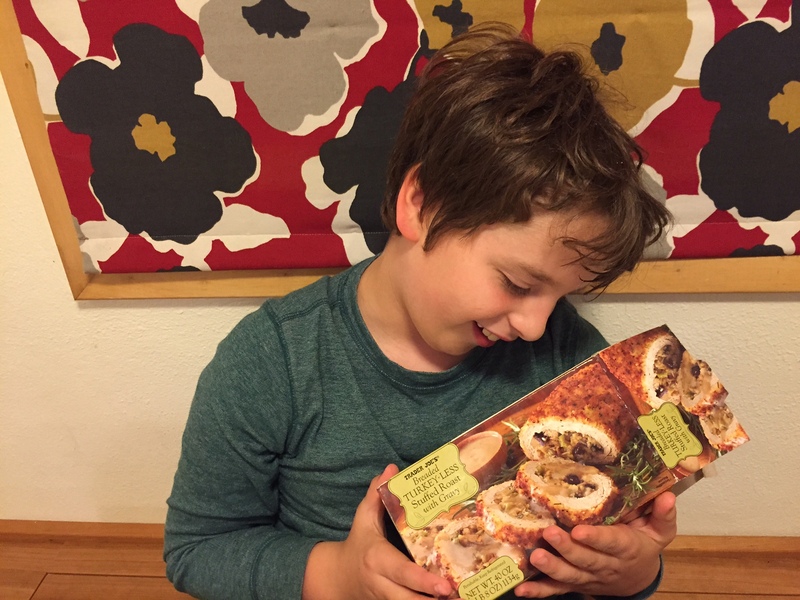 I think you can sense the adoration in how G is tenderly cradling the box. Jonathan and I really liked it too, and I think it would be a worthwhile investment to have for your vegetarian friends. It tastes really good hot, never had a chance to see how it would taste cold. I think this one will be a tough one to beat! We hear this expression used instead of Happy Thanksgiving often. The unfortunate turkey has been cast as the star of this annual feast of giving thanks, and gathering with friends and family. Although I have only been eating a plant-based diet since March 2012, I have never made my own turkey, and now it looks like I never will. It always seemed like a scary thing involving frozen items thawing, innards, and long baking times. 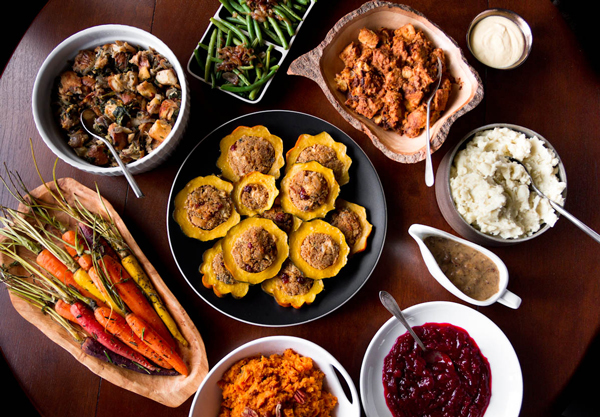 While it may seem impossible to imagine a holiday table without a big turkey carcass as the centerpiece, my favorite part of the meal has always been the side dishes, especially my mom’s stuffing that has nuts and dried fruit! 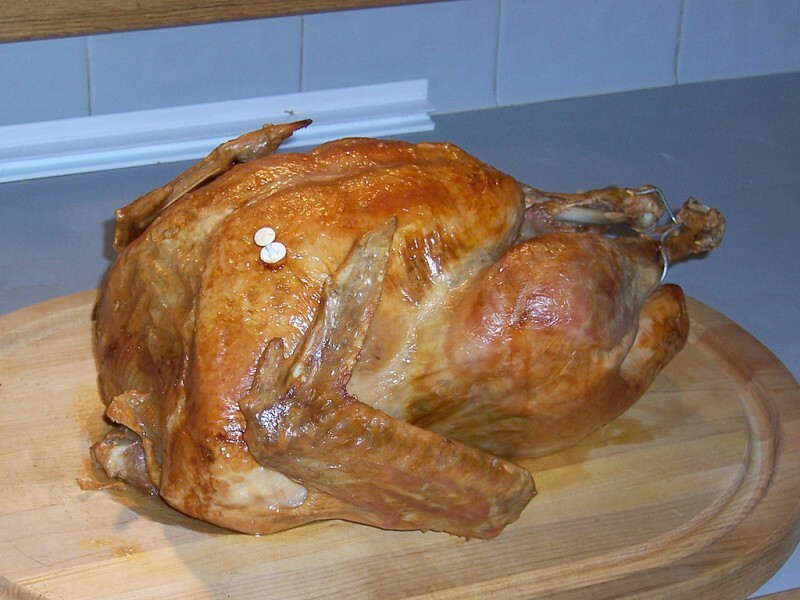 The main variety of turkey eaten in the US is a domesticated breed called the broad-breasted white. The average live weight of federally inspected turkeys has nearly doubled in the past 50 years, and the time it takes for a turkey to reach market weight has halved. 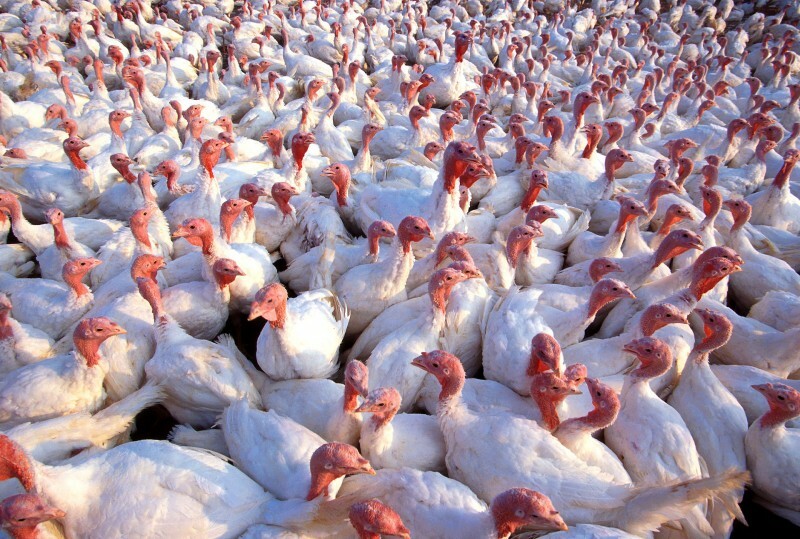 46 million birds will die just for Thanksgiving dinner. They are killed at only 18 weeks old, and are overly huge since the breast meat is preferred. In personality, turkeys are intelligent and sensitive animals that are highly social. They create lasting social bonds with each other and are very affectionate; rather similar to dogs. Many of these animals suffer needlessly as a result of being super-sized by factory farming methods, as we buy excessively large animals to impress our guests. Americans throw away about 35 percent of edible turkey meat each year. So most people are buying turkeys 1/3 larger than they will even eat. Considering this, you have several options besides just blindly following tradition. 1. My favorite: Make a true harvest dinner, like this delicious spread. Most of the traditional side dishes can be made without animal products, use vegetable broth instead of chicken broth for example. 2. Buy a turkey substitute like a Tofurky or make your own! 3. Keep in mind the treatment of the animal by understanding labels. It is more expensive to worry about these things because the animal has been allowed to grow naturally, and it is cheaper to raise animals with unhealthy food and space. For some reason, with turkeys, a single bird is eaten per family (rather than just sliced off portions of a whole animal), which makes it seem more personal. I vote for keeping guilt off the plate entirely. Plan ahead for a happy and compassionate Thanksgiving for all! Earlier this year, we won a raffle contest at my daughter’s school. It was so exciting to win a free trip. We had three choices of places to go, but the only one where our whole family could go, was the trip to California. It included airfare, hotel, a dinner at Medieval Times, Knotts Berry Farm tickets, and 2 day passes to Disneyland. The kids and I had gone to Knotts and Disneyland 7 years ago with my mom. I remembered them riding Dumbo and all the little kid rides, this would be a very different experience with them so much older and tall enough to ride all the rides. My husband and I are not really into theme parks, and I have to admit, I just don’t understand the appeal. However, it was something we wanted to do for the kids to enjoy. I had done a little research as to how we might be able to eat vegan, or even vegetarian at these places since I remembered people eating giant turkey legs last time we went. It appeared there would be some options. Since we were staying in a hotel and taking a shuttle bus to the park, we didn’t want to cart food around with us. But, after our experience, my advice to you is bring your own food. I’m going to write about the veg aspect, and try to separate our experience from the fact that it was over 100 degrees in mid-October most of the time we were there! Record-breaking heat for them, and made everything a lot less enjoyable. Here is our best moment, cooling off at Splash Mountain. This photo makes me laugh every time at our reactions. The best vegan experience we had was actually at the most surprising place- Medieval Times, a dinner show featuring knights jousting. It was surreal, especially as we had no idea what it would be like. You are given a paper crown to wear when you enter, and that is “your” knight for the evening. There were about a million ways to separate you from your money from the moment you enter this already expensive show—from a family photo with the king ($21), to a full gift shop. You are served your meal while watching the show and cheering your knight with optional $5 flags. I didn’t see anyone else order the vegetarian option, but it was quite good. It was comprised of a stew of potatoes, beans and rice served in a bucket; tomato soup; hummus, pita bread and vegetables. The apple pastry at the end was not vegan- it was supposed to come with a sorbet I think. As you can see in the photos, everyone is served a huge portion of chicken. The woman next to me ate practically none of it. It was depressing to see all those chicken legs, but I appreciated that they actually offer a delicious and much healthier substitute meal. There may have been veg options at Knotts Berry, but we didn’t look past the chicken dinner restaurant and another place that only offered grilled cheese, instead opting to go to TGIF nearby. We got their black bean burger for $13.49, and I believe it was the only adult veg entrée available. It was the same Chipotle Bean Burger that we get from Costco for at most $1.50 each, which is a good burger but quite a big mark up! For Disneyland, we found a portobello sandwich (that was delicious) in Tomorrowland. It had a full mushroom, large grilled red pepper and onions. It was not vegan, and it was already prepared with mayo (I think) and 1 slice of cheese. We ate that twice. We tried to find other places, like Ariel’s Grotto, which was supposed to have a tofu scramble. Unfortunately, you have to make advance reservations to eat there. One night we ended up at Flo’s V8 diner in California land seeking out the veggie tater bake. After waiting in line for 20 minutes, we found out that they were sold out! As you can see all the other entrées were mostly meat. One could argue that you could eat a salad without the meat, but after being in the sun and walking all day, we were hungry! And our kids don’t eat salad, and how difficult is it really to offer veggie options? Especially if they sell out of them. Do I sound bitter? Here is a photo of our dinner comprised of sides. And no, not vegan. One night we went to visit friends in the area, and stopped at a grocery store for some BBQ items, where I got to finally try the Beast Burger. They had delicious salad and fresh fruit, it was the best meal of our whole trip. The last morning of our trip we went to Jamba Juice in Disney Town, and we all got large smoothies. I got to try their new Almond Milk smoothie with pumpkin, banana and cinnamon. It was delicious! Kudos to Jamba Juice for offering these new dairy free options. So, while it is possible to eat veggie in Disneyland, it is much harder to eat vegan. And I don’t want to hear about frozen lemonade, french fries or an ear of corn as options. I want a real meal, just like everyone else. Experiencing how difficult it is to eat vegan, and how predominant the meat culture is in America really shook me up a bit. I know I live in a bubble normally – Portland is one of the most veg-friendly cities in the world. I usually eat at home, or can easily choose where to eat. Until you stop eating meat (and especially eggs and dairy), you don’t realize how little choice that consumers have. We need to have those options so that people can choose them. Ever since my first batch of cookies were gobbled up last week, I thought about trying a different recipe. The first batch was so easy, and this new recipe was a bit more complicated and expensive. But, so good… like toffee cookies. And you will want to eat the raw dough before baking, and you can. They were extremely sweet, and I did not make them gluten-free. Kids loved them even though there were a lot of nuts. I think on this kind of recipe, smaller chocolate chips are better than large chunks so it sticks together even better. 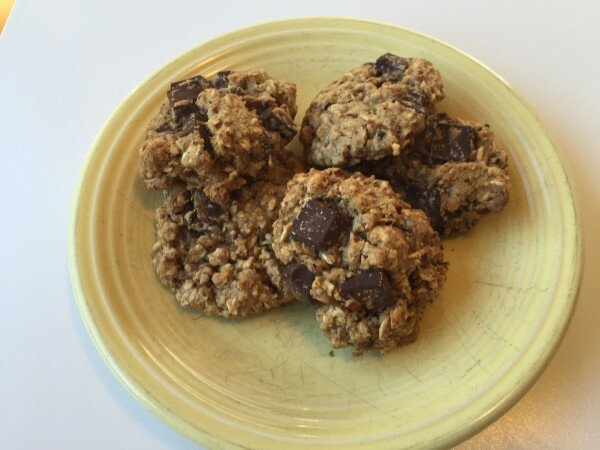 Another Oh She Glows recipe, Turtle Oatmeal cookies. Last night we had friends over for dinner… a very rare occasion lately. I knew from past experience that A was a really good cook, and that is always a bit intimidating. I decided to go a really easy route since we had 4 kids to please, and do a Mexican dinner- plant-based style. This sweet potato enchilada recipe on Oh She Glows sounded really good… even though we have had a lot of sweet potato lately. The cilantro avocado cream on top really made this dish in my opinion. The enchilada part was good, but not the ultimate… but with the topping it took it to another level. Served it with Mexican rice and vegetarian refried beans. A brought a delicious avocado salad and we were all set. This is the quick, go-to sandwich when you are our of everything. I have made it different ways- with pickle relish makes it like an egg salad. This is a pretty typical recipe, although I usually don’t use onion. I wanted to highlight this website because I really like the illustrations, and the name. 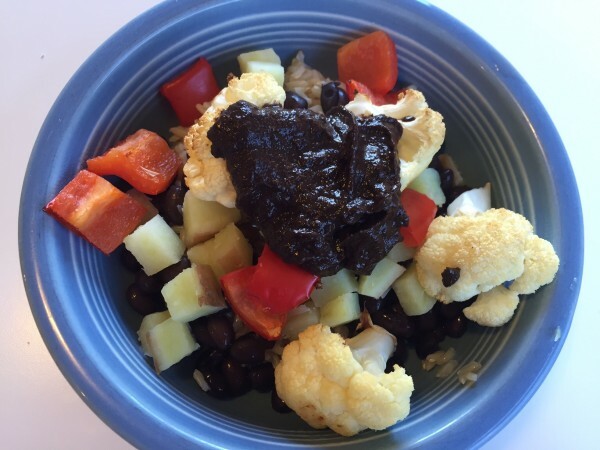 For the Meal Mentor plan, I made Cauliflower Molé. This was a bit strange… I don’t think it was super family friendly. Or at least my kids weren’t interested. Roasted diced red pepper and cauliflower. I am not a fan of cauliflower (especially if it is raw). In fact, the only way I have enjoyed it is as a creamy alfredo recipe. So, basically disguised beyond recognition. The molé sauce helped a lot, I may have mad it too thick. In any case, I wouldn’t add this recipe. Instead, I want to recommend you make the alfredo sauce with fettucine! See picture on recipe page. Cauliflower Alfredo sauce recipe from Oh She Glows.